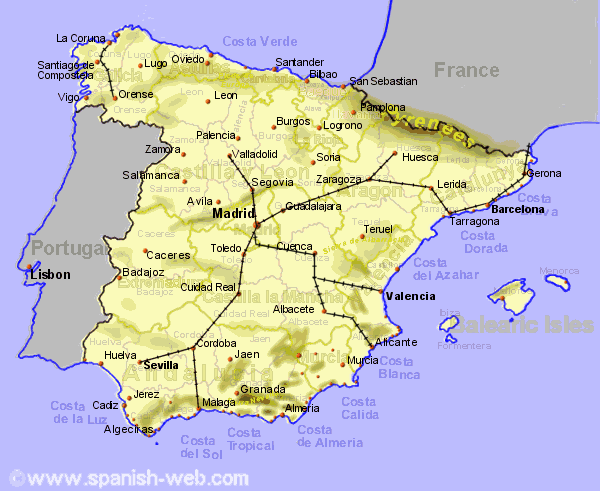 Spain is developing a network of special high speed track, designed for the AVE train (Alta Velocidad Espa�ola - which translates to Spanish High Speed), although this track can be used for some other train types. The AVE (of which there are more than one version built by different manufacturers) run at speeds of upto 300km/hr (186mph) although the newer AVE S103 is capable of 350km/hr. The AVE can only run on high speed track and have very few stops (Madrid to Barcelona can be a non-stop train). The AVE trains are very punctual - if they are over 5 minutes late getting to their destination on the Seville line, passengers are entitled to a full refund, and on the Barcelona line if over 15minutes late. The Talgo200 and Altaria trains can run on either high speed or standard track running at speeds of up to 200km/hr (124mph) on the high speed track. Both of the above train types have a buffet/bar and/or a restaurant with waiter service, air-conditioning and equipped with reclining seats, video screens (films are shown). The AVE has three classes of seating: first ( club), business ( preferente) and tourist ( turista), while the Talgo200 has 2. The AVANT trains are high speed trains running shorter routes, only on the high speed track - Madrid - Toledo; Madrid - Puertollano; C�rdoba -Sevilla.